Published by Cyril Huze December 15th, 2016	in Builders, Editorial and Events. Indian Motorcycle is recalling 2014-2017 models for a potential fuel leak. 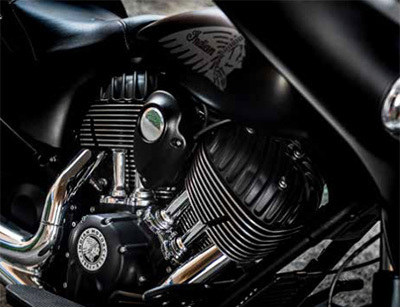 Are concerned: Chief Classic, Chief Dark Horse, Vintage, Chieftan, Chieftan Dark Horse, Springfield and Roadmaster manufactured from April 15, 2013 to July 15, 2016. The very popular Scout and Scout Sixty are not affected. In the US, 23,746 motorcycles are recalled with more to be also recalled abroad. The fuel rail may contact other components, causing the fuel rail to chaff and leak, and in presence of an ignition source this could create a fire. Indian is currently notifying all owners to have their dealer install a bracket that will limit the movement of the fuel rail. The fix is free of charge. You may contact Indian customer service at 1-877-204-369 or the National Highway Traffic Safety Administration Vehicle Safety Hotline at 1-888-327-4236 (TTY 1-800-424-9153),7. Indian’s number for this recall is I-16-03. Rebel – Who said anything about lawyers? This is just good business. Hmmmmm, the perfect Indians having problems? Imagine that. I thought is was only Harley’s that had problems!!! “The popular Scout and Scout Sixty are not affected.” So, the other bikes are UNpopular? Just a gentle rib, but perhaps why some folks keep saying there’s a bias towards Polaris/Indian. Personally, I think any bike that is sold by the thousand is “popular”. Woody’s. What’s wrong with writing that the Scout is very popular? What’s your problem? Approx. four years of production…24,000 bikes being recalled…Sounds like units produced a year are about 6000. Adding in the scouts maybe another 3000 per year ???? Woody’s, I bet that Cyril knows Harley and Indian and others sales numbers better than you do. Folks have been jumped on for saying there was an Indian/Polaris bias here, and I found the wording interesting. That’s all. Sorry, i don’t get it. Reporting a massive recall by Indian is a favor made to Indian? Against Harley? Woody, you’re screwed ip. if this does not directly effect a person as an owner, why would one care, or for that matter feel the need to even comment on this? Just a question/observation ……not an opinion. This is why I backed away from posting here. Petty arguments over nothing. Let people make their comments and move on. No need for this school yard bickering. Since mankind began to write; writings have been misconstrued and maligned. In other words please comment on the subject at hand rather than the comments themselves. Build bridge -> get over bridge. It is kinda funny that there were so many negative comments about HD and their recalls the moment there is a Vindian everyone gets precious. Like I said along time ago corporatisms drive for ever greater profits causes all this, it does not matter who you are. Look at the once near perfect Toyota. It is all greed driven. But wait……. what if we put more robots in, that will fix it. But Wait what if there is no one left working to buy the greed inspried products…………. The reality is our machines today are more complicated and producers are expected to get ever more complicated ones to market at an ever more accelerated pace. My next car and my next bike will probably be subject to multiple recalls no matter what brand I buy. Only three recalls since a totally new motorcycle has been designed and built from the ground up. A lot of manufacturers would envy that record.